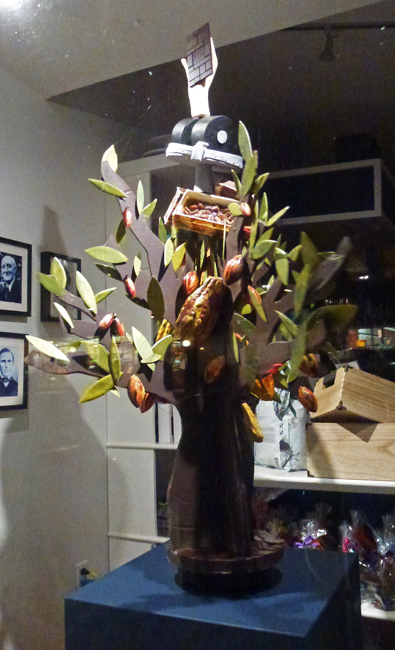 A couple of doors along from yesterday's macarons shop is a chocolate shop and they had decorated their window with a chocolate tree with even the leaves made of chocolate! YUM, I love chocolate! Happy Friday, enjoy your weekend. Happy Easter to you and your family! Anything chocolate & I'm all for it! Wow, that is quite a creation! Also, I bet it smells wonderful inside that shop! That is my kind of tree! How do i plant my own!!??? Gorgeous creation. And tasty too. That's clever. I love anything made of chocolate. Oh, gimme a break! This should be illegal. That's inviting corruption and dissolution and the ruination of some of our souls, not to mention what it could do to our waistlines. Hope your weekend is filled with things just like this, along with lots of love and fun! Yum yum. What a nice idea! Tis the season, I suppose! That's funny, I thought of your photo, as this morning they were talking about macarons on CBC Ottawa. They were debating how to pronounce it, neither being a French speaker. I've never eaten a tree before, but I'd surely take a bite out of this one. Oh yes! I want a bunch of these trees inside and outside! Interesting. I have seen chocolate sculptures in Europe but not so much in the USA. But that could be because I will go into a chocolate shop in Europe but less often in the USA.